Chicago just had its first major snow storm of 2016 and all of the sudden people who were running around in shorts last week are now shoveling snow in their thick winter jackets. Oh, Chicago, how do you manage to get us by surprise… year after year, after year? Clearing the snow on the ground is important, but don’t forget your roof! The main reason you should keep your roof as snow-free as possible is that it’s crucial for preventing ice dams from forming on your roof. Obviously, ice dams can’t form without snow. 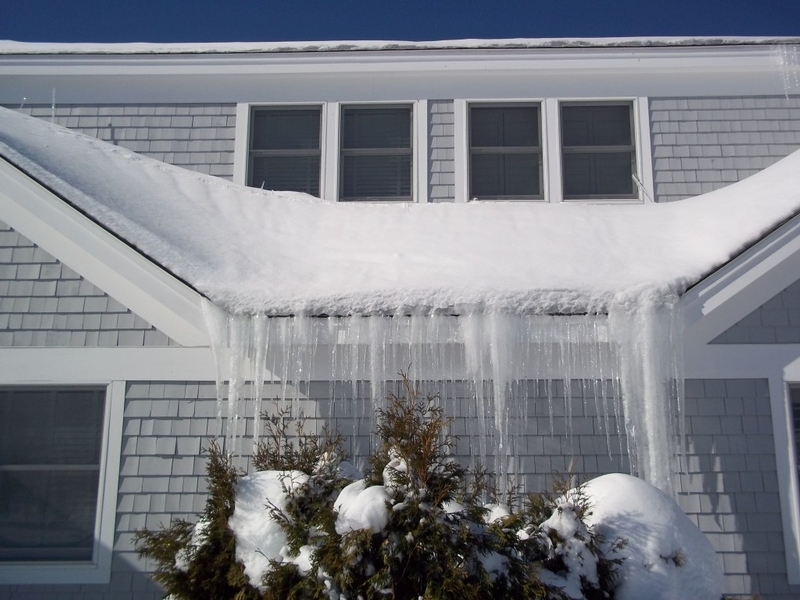 If you’re able to prevent ice dams, you’re far more likely to prevent your roof from leaking and damaging the inside of your home. How do you know if you have an ice dam? Look carefully at the icicles around the exterior of your house. If they are confined to the gutters and there is no water trapped behind them, then an ice dam has likely not formed. Nonetheless, icicles can pose a danger to people when they fall off, so try to safely knock them down while standing on the ground, making sure not to stand directly beneath them. If you cannot safely reach them from the ground, consider hiring a contractor to help.